With more than 25 years of technical and managerial experience, G Radhakrishna Pillai, CIO, SRL Limited is known for his skills of solving business problems with information system technology solutions by process improvements and innovations. Radhakrishna Pillai is associated with SRL Limited since January 1998. SRL Diagnostics is one of India’s largest pathology lab networks with 12 reference labs, four Centers of Excellence and 281 network laboratories. He is responsible for all strategic decisions pertaining to IT & CCG interventions aimed at process improvements in the company. He is renowned for his ability to plan, design, implement, and manage Information Systems in a relevant, timely and fiscal manner deploying leading edge strategies/systems that significantly improve profitability and customer satisfaction. Successful at developing and executing a ‘contributing’ information technology strategy that supports organization through effective leadership, strategy development and execution. Prior to SRL, Pillai held various ranks in several reputed Indian companies with different business verticals like entertainment, FMCG, market research and engineering and his assignment was with Vadilal. Prior to that, he had worked with Nimbus Communications and Transpower Engineering. Pillai is a graduate in Statistics from Kerala University with diploma in computer science, diploma in marketing management from Institute of Management & Personal Studies, Mumbai. Due to Pillai’s understating of technology and its impact on business, SRL is the most advanced state-of-the-art technology with ISO certification and also recognized by the Government of India’s Department of Scientific and Industrial Research. Pillai implemented ‘SRL web reporting’, which enables customers to access their lab reports online. As a result, it enhanced customer experience, and gain customer loyalty. He also implemented a portal for customers to view and download their lab reports, track their health through healthtracker, maintain their historical records. One of the prominent projects deployed by Pillai is ‘ePathology’, which enable customers to order test and make payment online. 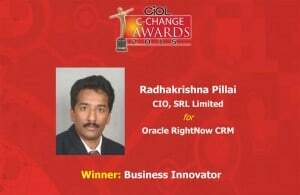 He recently implemented ‘Oracle RightNow CRM’ at SRL for higher operational efficiency in its centralized call center. Recognized as a visionary for pioneering innovative solutions with comprehensive understanding of how technology impacts business, Pillai has been felicitated in various national and international forums for IT professionals. He was recently awarded for ‘Business Innovator’ for CIOL C-Change Awards 2015 at C-Change 2015. He is not only recognized for his work, but he is also is also pro-active in the CIO community for building the ecosystem together. Pillai is a key member in the governing body of CIO KLUB, India. Pillai conceptualized and deployed various business applications for which SRL was ranked amongst the Best 10 IT implementations in India for the year 2005 by PC Quest. Among the many qualities associated with Radhakrishna Pillai, he has applied that skill to a number of companies, in a variety of industries, a rarity among CIOs who tend to gain excellence in a specific industry vertical.